Guy Holbrow is not only one of the co-founders of LFTC, but he also is the first male athlete in the club to qualify for Kona. Here’s his account of the big day on the island, the emotions, the race and the celebration. It’s a great read and we are so proud! For me this was never about attempting to win my age group at the Ironman World Championships, but celebrating all that I’ve been fortunate enough to achieve in the sport of triathlon. Aloha friends and family, I’ve lived my big island dream. Something, to be honest, I thought would remain out of reach! Since I qualified a few months ago for this momentous race, made additionally special by its 40th anniversary, I’ve been on cloud nine. I feel so proud to be the first male triathlete from LFTC (London Fields Triathlon Club) the club I co-found almost 10 years ago… I’m now writing my race memoirs on the airport tarmac waiting to jet off home; funny how time flies by! It’s no surprise the humid heat here renders you instantly humble and a few pounds lighter, without so much as taking a few steps. We decided to stay a few miles out of town up in the hills for some cooler evening temperature and away from the crowds. However, with hindsight, I think it may have been easier had we found somewhere to stay within walking distance from the race epicentre and in a single storey detached condo. Unfortunately in the week leading up to the race we had disrupted sleep on account of people staying above us, not even our silicone earplugs could silence the floorboards! This did stress and discombobulate us, not the ideal preparation; I missed the parade-of-nations as I’d got my days mixed up, a GB team gathering that I’d been looking forward to, but it turned out to be uneventful in the end, spoilt by a rare downpour, so I was happy to have got some much needed rest on the beach instead. The moment I first walked out onto the tiny hint of beach, where we’d be stepping down onto on race day, was something else. I’d arrived and became just a little emotional as I gazed in awe around me, soaking up the abounding energy. The water was crystal clear, warm and vast. I did my first run out among the lava rocks late that afternoon. A fellow racer I’d got chatting to earlier on in the day in the main support bike shop, while I waited for some unforeseen last minute bike repairs, preempted the elevated heart rate I would likely experience for my first outing, he wasn’t far wrong! I have a particularly high sweat rate, so I new I’d consummately shed a few more pounds before the big day and was never without a bottle of water to hand. My first practise ride just blew me away, the silky smooth roads, effortlessly cruising along at 30km/hr, but not before long, the sweat was dripping off me! Well, you would have thought I’d have the sense to opt for the ventilated road helmet rather the airless aero one, right? a decision I deliberated over right up until dropping off my bike in transition! Aero it was, fortunately I picked up a good tip from a fellow racer, who advised squirting water up into my helmet, which turned out to be invaluable! I had a comedy run in with mine and everyone else’s favourite Kona icon and legendary triathlon spokesperson, the one and only Bob Babbitt! I was dropping my sister and nephew off at their swanky, gated accommodation one evening. Unsure how I would exit the complex, I dashed over to a 4×4 that had just parked up and to my astonishment Bob was sat in the driving seat. I exclaimed ’Bob!’, he asked my name and where I was from and we shook hands. In my overzealous reaction I then proceeded to close his car door which he’d only just opened! He had to remind me that they were staying, a delightfully awkward moment, but one I’ll treasure, as I ran back excitedly to our car to let Emily know about the unlikely driver. I was having a great day, as earlier on I’d stalked Mark Allen (6 times Ironman Kona winner) along Ali drive, unsure whether to ask him for a photo and then shortly after bumped into Joe Skipper, the pro-winner of Ironman UK where I’d qualified. I introduced myself and reminded him that we’d met once before at a remote James Bond hideaway, a derelict quarry out in Southern Spain where I’d been on a training camp with my old club. Race day started the evening before, a sleepless night eased me into my long day, as I lay in anticipation, not really nervous, just awake to the full realisation of what I’d dared to dream. I’d chosen to avoid the hustle n’ bustle of the swim start and positioned myself at the front but on the least congested far side of the pier. Treading water several minutes before the start was something else, I was in a state of absolute joy, as I bobbed up ‘n’ down in the morning sun with the feeling that, in life, anything is possible — ! Boom ! — the comedic ‘Spinal Tap’ sized cannon triggered the eruption of flailing arms and legs; a little bumper car action and the odd wallop, but thankfully everyone alongside managed to maintain a good line. The giant rolling waves, a warm reminder of swimming the inaugural Ironman Wales in Tenby with my dear friend Andrew. The warm-up swim felt easy, testament to the years of training. The only sea-life I saw were scuba divers below, filming the surface action. The only mistake I made was not to apply sunscreen in T1 (swim to bike transition). We were given strict instructions not to apply sunscreen prior to being numbered-marked on the arms; my skin has since been flaking off my forearms! I began the bike steadily, spinning to temper my heart rate; this always feels slow, even more so as bikes were frequently passing. I was slightly unsettled mid-bike, as my watch showed that my heart rate strap had only just connected, and unfortunately the heart rate monitor from my watch is inaccurate by approx., 10 heartbeats too high; in which case I’d unknowingly been taking it easier than planned and I’d also forgotten to factor in the slightly elevated heart rate from the heat too! Ah well, the upshot at least was that I’d ridden well within my means on the bike… Now the only ‘dark cloud’ episode of the whole day were the numerous bike packs blatantly drafting, each time I sat up in disbelief as they swept by. On one occasion I shouted out “you’re only cheating yourselves”. At the first penalty box, I saw a number of triathletes taking their five minute penalty, but I think the majority had got away with it. I appreciate that bunching is inevitable, but this was more like riding in a sportive than a non-drafting race! For those unfamiliar with the benefits of drafting, competitors over this distance can potentially save anything up to 30 minutes, a significant time-saving. This guilt-free mindset is no different to doping; in that everyone assumes a level playing field if everyone else is partaking, so why not tag along for the ride! I knew that at some point I would have to take painkillers, as being in the aero position for prolonged bouts takes its toll on my back, having to frequently stretch it out. But I was mentally prepared for this and thankfully for the last hour I was able to be reasonably pain-free in the aero position. I’m always relieved to get off the bike and thankfully my legs felt fine as I’d taken it relatively easy, always ensuring a high cadence and never pushing too big a gear. Into T2 (bike to run transition) and thankfully this time I had a volunteer standing close by with sunscreen that they slapped onto my forearms. I applied a liberal amount of body glide all round my toes, laced my trainers and took off; my support team cheered me on as I stopped to tighten up my laces. But nothing could prepare me for running in this stifling heat. I pretty soon lowered my planned race pace, walking every aid station to stock up on sponges to tuck under my trisuit and ice cubes to place under my cap and drinking plenty of water to flush down my decanted gel and electrolyte mix. Soon I could hear and feel the squelching in my trainers, with the continuous cascading of water down my legs, I knew it would only be a matter of time that my feet would start to blister in the areas where I hadn’t applied lubrication. I really can’t describe how hard it was to run in this humid heat, exacerbated by the additional heat rising up off the tarmac; but this is Ironman and the World Champs and it’s not meant to be a breeze The unusual lack of winds made the bike easier for sure, but they wouldn’t have gone a miss on the run! 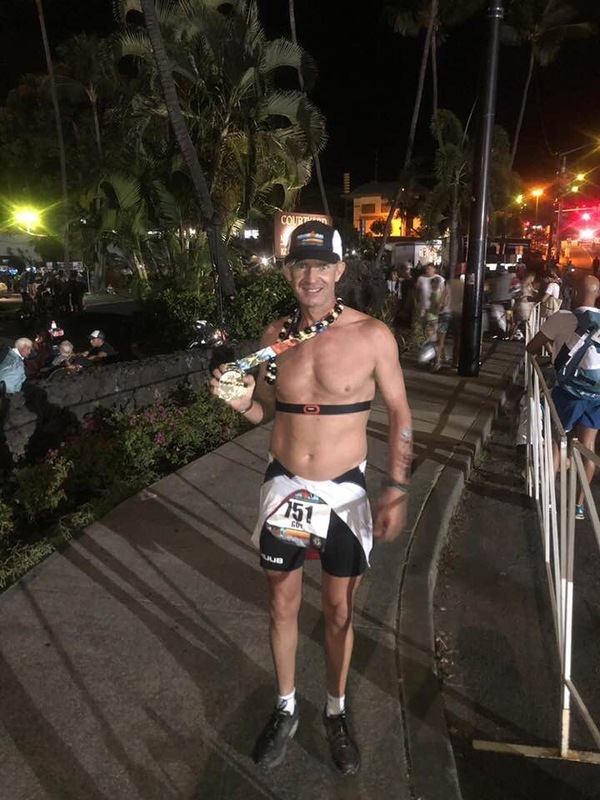 Running the last mile into Kailua-Kona was really quite special, I turned to a fellow racer and said “now for the best bit, eh!?”. I recall looking at as many people cheering by the roadside, in what felt like slow-motion, high-fiving with both arms out wide, weaving from side to side. I can’t remember the last time I felt so high, that began with a beaming smile from sunrise to a perfectly timed sunset, just lapping up every second. I’ve lost count of the number of times I’ve dreamt of this finishing shoot, and it didn’t disappoint; the video of me crossing the finishing line says it all, thanks Dave for recording and zooming in on me looking jubilant and wired I weighed in at 144 lbs and didn’t lose a pound! That’s probably what I’m most pleased about, confirmation that I’d been consistent and spot-on with my hydration and fuelling. 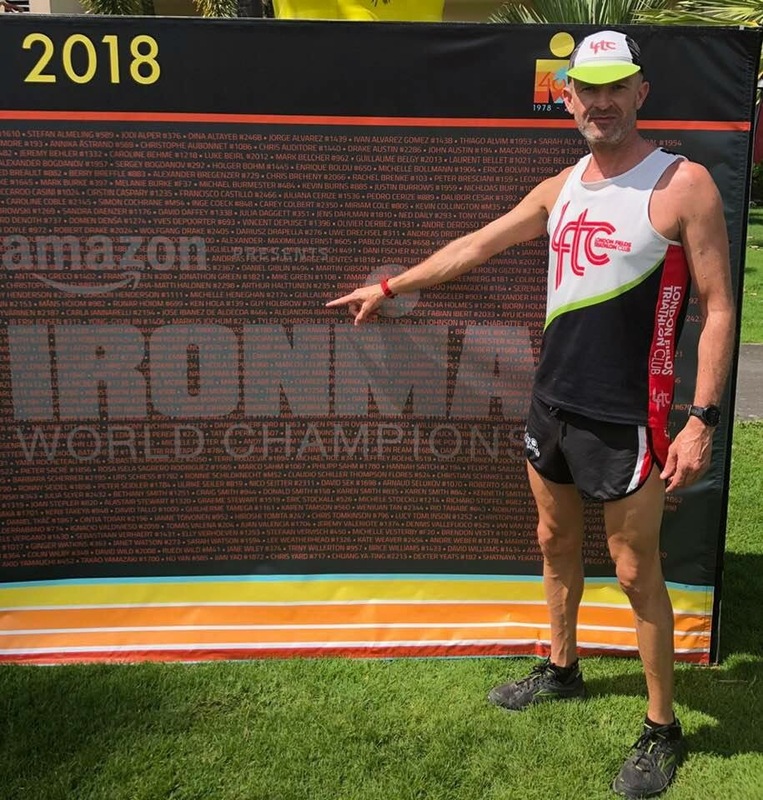 I was reluctant to add this appendix, but for all of you who know my history in the sport, you will know what a challenging relationship I’ve had with Ironman racing. There have been times when I’ve placed so much pressure on myself, to the point where I’ve been unable to compete the morning of a race However, in these traumatic moments, I’ve found triathlon as an incredible mirror, bringing to my attention deeper unresolved emotional issues, which I’ve then gone on to address; it’s never just been about the sport of triathlon, but so much more! I’m unsure if I’ll ever race long again as I’d like to try a few other challenges and will more than likely follow a circular trajectory and return to Middle and Olympic distance racing, so training can fit around my life rather than visa versa ;-). I’m already considering qualifying for the Ironman 70.3 World Champs in New Zealand 2020 for the full-set, but mainly as an excuse to visit my dear friends Tim (my fellow LFTC co-founder) and Sarah. I’ve already entered the Bath half marathon and Brighton marathon for early 2019, so I don’t lose all this amazing fitness and my lean looks! I made sure this would be a celebration of all that I’ve achieved in triathlon and I’m so glad I did. I certainly raced, but never forgot why I was here and what this meant. “Mahalo Hawaii”, for allowing me to celebrate this extraordinary and beautiful adventure, the best 50th Birthday present I could ever have wished for.